As users post messages containing links into Slack, we attach simple previews, adding context and continuity to conversations. With a Slack app, you can customize these link unfurls further, turning brief reading experiences into something richer. Bring your own content and make it thrive: actionable, interactive, and easily addressed by URL. Or just keep it simple and let your content stand vivaciously alone. There are at least two kinds of unfurls. Slack app unfurling - When Slack encounters links your app is associated with, we send your app an event & your app decides what to do next with it. It's an exciting opportunity to start an interactive message workflow. 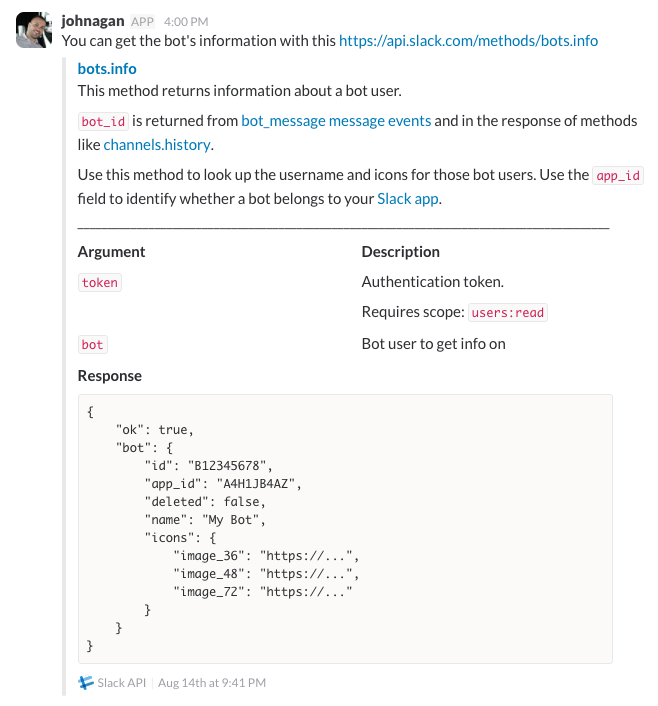 Classic unfurling - When Slack spots a link, we crawl it, devour its metadata, and spit out a mostly uniform summary. If you've already read Everything you ever wanted to know about unfurling but were afraid to ask, then you might not actually know everything yet. Let's start with what's new. 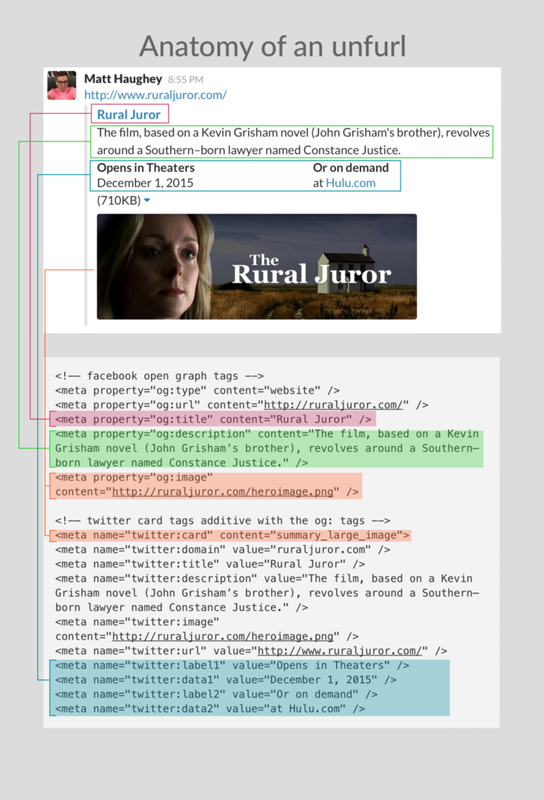 Teach links new tricks by using the Events API and Web API together. Of course, you'll need your very own Slack app. Don't know if you're ready to get started? Read our announcement about app unfurls. If you haven't already, set your app up to support the Events API and subscribe to link_shared events. Using your app's Event Subscriptions configuration page, register one or more domains your app will provide unfurling behavior for. Install your app into your Slack workspace if you haven't already. You'll need the links:read and links:write scopes to perform all operations. Provide an inciting incident: have a member post a message containing a fully-qualified URL matching the registered domain. Your app will receive a link_shared event, giving your app the hints it needs to do its thing. Your app uses chat.unfurl to attach custom unfurling behavior to the original message. Like a cherry on top of an already special sundae, you can make the messages interactive too. Let's review that song and dance in more detail. You'll need a Slack app and a server Slack can reach to follow along. If you want to develop locally, consider using a connection proxying tool as described in this tutorial. Set your app up to use the Events API. You'll also be using the Web API — to unfurl links you'll need both the links:read and links:write permission scopes. Before installing your app, be sure and set up your event subscriptions and register your domain. Your app will be notified when a message containing a URL its interested in is posted to a channel it has access to. The vehicle for this notification is an Events API-only event type, link_shared. These events do not contain the message itself, but instead just the info about the message you need to provide it unfurl behavior: the message's ts value, the channel it appeared in, and which URLs it contained matching your registered domains. There are two kinds of event subscriptions: "Team Events" and "Bot Events". Slack app unfurling only supports "Team Events." Subscriptions to "Team Events" yield events perspectival to the installing user. Your app will receive events as messages are posted in channels one or more installing users can see — including all of a workspace's public channels but only the private channels and direct messages the installing users may access. Your app can't unfurl links it's not party to. If Person A installed the app, and Persons B & C are direct messaging each other, your app can't unfurl links in that conversation. Slack apps can act as unfurlers for up to five registered domains. Register your domains on the Event Subscriptions page of your app's configuration. Domains must have a TLD and cannot be a TLD alone (example.com and another.example.com are valid, example is not and nor is .com). IP addresses are not domains and cannot be matched. All additive subdomains and paths to the domain you provide will be considered matches. By including a subdomain in your domain, you exclude the naked domain. When users mention links to one of your domains, it must be fully qualified with a protocol (http:// or https://). Slack will not unfurl decidedly ambiguous domain and URL mentions. When users mention links and they contain an explicit port (like https://example.com:23/skidoo), Slack will still consider it a clean match to a registered example.com. Domain etiquette: You should own these domains and if you don't, you must follow all the terms, conditions, rules, policies, proclamations, warnings, and edicts around a domain. Be courteous, be kind, be helpful. Be sure and leave out the protocol part of a URL when registering your domain. Discard any http:// or https:// or path or query string components, please. Finally, Unicode domains are not yet supported. Before proceeding, make sure your Slack app has been installed on the workspace you're working against and that installation included the links:read and links:write scopes (or the bot scope if that's more relevant to your subscriptions). Adding or removing domains requires re-installation of your Slack app. Every time an app is installed, the installing user is agreeing to those specifically mentioned domains. You've set everything up: your Slack app, the Events API, a link_shared event subscription, and you've registered your domains. You've installed your Slack app on a workspace, specifically requesting the scopes you needed and after you've registered your domains. You have the knowledge. You have the back end. You have the power. You are ready to receive and react to link_shared event deliveries. For detail on most of these fields, consult the Events API field guide. token - This is a verification token, a deprecated feature that you shouldn't use any more. It was used to verify that requests were legitimately being sent by Slack to your app, but you should use the signed secrets functionality to verify requests now. event - this is where all the stuff you're looking for lurks. It's an object. type string Yes The specific name of the event described by its adjacent fields. This field will always be link_shared for this flavor of unfurling event. channel string Yes The scene of the crime! This is where the link was mentioned. It's a channel ID, which means it might begin with C for a public channel, D for a direct message. But really, your app shouldn't care what it starts with. You'll need this mostly opaque value when using chat.unfurl to attach your content & behavior to a message. user string Yes The user ID belonging to the user that posted the message mentioning the link. If the content you unfurl requires some kind of authority to post in a channel, compare this value with your explicitly authenticated records before proceeding. See authenticated unfurls for more info. message_ts string Yes Almost all Slack messages have their own kind of quasi-timetsamp quasi-ID value called ts. You'll find the message that mentioned the link's ts value here and you need to provide it as part of chat.unfurl, along with channel. thread_ts string No When the message is posted within a message thread, this field will contain the quasi-timestamp for the thread parent. Once you've received this event it's time to do decide what to do next. Most likely, you'll use those url values to look up what to display to the user. Maybe you'll make an API call to another service. Maybe you'll just reference your app's own base of knowledge and never even hit another service at all. Be sure and respond with a friendly HTTP 200 OK to the event as quickly as possible. Do not wait to wrestle an unfurl with chat.unfurl before telling Slack you received the event. You'll probably want to enqueue behavior like this. Consider this link_shared event a kind of ping. Now it's up to you to pong with chat.unfurl. The Web API method chat.unfurl takes a message identifier, a pointer to the channel where it was mentioned, and your wonderful content. The links:write scope requested when users install your Slack app grants it the ability to leverage user tokens to attach additional content to messages mentioning your registered domains. Sorry, bot user tokens cannot use chat.unfurl directly. You must still request the links:write permission scope and use the installing user's token instead. token - the user token granted to you when installing your app for the workspace you're acting on behalf of. unfurls - a URL-encoded string on JSON, detailing the blocks or attachments you'll provide for each mentioned URL. See below. user_auth_required - (optional) require the user posting the link to authenticate with your app first. See authenticated unfurls below. The provided ts value must correspond to a message in the specified channel. Additionally, the message must contain a fully-qualified URL pointing to a domain that is already registered and associated with your Slack app. All of these things must be true to use chat.unfurl. The third important parameter to provide to chat.unfurl is unfurls. When posting with application/x-www-form-urlencoded content types, the unfurls parameter expects a URL-encoded string fragment of JSON. You can also use application/json with chat.unfurl. Unlike chat.postMessage's attachments parameter, it does not expect a JSON array but instead, a hash keyed on the specific URLs you're offering an unfurl for. Each defined URL may have a single attachment, including message buttons. All the typical formatting available to you in message attachments hold true, except you can have only one per URL. "text": "Every day is the test." Your work here is done, unless you're conducting interactive message operations. Of course, there are error responses too. You'll receive them if you forget to include ts, channel, and properly-formed unfurls attachments. See the errors section of chat.unfurl for more info. That's it. You made a link unfurl and added to the complexity of the universe in your own way. Since the attachments you provide as link unfurls are just like other Slack app-enabled message attachments, you can make them interactive with message buttons too. Let's build on the knowledge gained so far and, provided you've set yourself up to use message buttons already, let's examine a more complicated example. Let's say your app received an event detailing a match for https://figment.example.com/imagine. This is a service you provide to help stimulate the imagination. At this specific URL, you generate a random imagination exercise to stimulate the working mind. Now your interactive unfurl is firmly attached to the originating message, complete with buttons. Almost everything you already know about message buttons is true for these kind of buttons too. When a user decides to click on one of your buttons, we'll send your action URL an invocation payload just as usual. The only catch is that the original_message field will only contain the message attachment your app added when providing the unfurl. You still can't see the entire message. Looks like the user decided for the ship to self destruct after all. is_app_unfurl boolean No When set to true, this invocation is related to a Slack app unfurl your app is registered to handle. When absent or false, it's a standard message action. original_message object No Contains attachments relevant to link unfurling from the original message that started this flow. See below. Within an action invocation's original_message field you'll find an array containing only the attachments relevant to your unfurling behavior — in fact they are the same attachments you provided in the original chat.unfurl call that initiated this workflow. But we've decorated them with some helpful fields. app_unfurl_url string No This is the URL that sparked this flurry of activity. Tie this to a URL received in a link_shared event you processed. is_app_unfurl boolean No When set to true, this specific attachment is related to a Slack app unfurl your app is registered to handle. When absent or false, it's a standard message attachment. From this point forward, you can use the response_url and all the other tools in the interactive message toolbox to evolve this workflow. What next will befall our intrepid interstellar travelers? Of course, not all links are wild and free, full of content anyone can see. Some links require you to pay the piper or validate your identity and authority to access. We provide a helpful way to ask the user posting a link to your service to authenticate before proceeding with an unfurl the whole channel can see. By selecting Install from App Directory, users will be taken to your application's installation or configuration page — even if it's not part of the app directory. Unless you're building an internal integration, you'll likely want to provide an Add to Slack on your app's home page that requests the links:read and links:write scopes. This way you use the OAuth sequence to validate the authority of the member to unfurl privileged content within a channel for everyone to see. During the callback step where the user returns to your website, you would capture any needed additional information about the user about their identity on your service. What you need to do is up to you and the context of your content. Avoid surprising users by doing something unexpected. After installation, the next time the user posts a message mentioning your links (or even retroactively), you can provide unfurl attachments. To send users more directly to your website and a personalized authentication flow, use chat.unfurl's user_auth_url parameter to provide a "just in time" URL on your servers. Or, painstakingly author an amazing ephemeral message with simple formatting using the user_auth_message parameter, including the link to your custom authentication flow in the message. When building an app that also needs to authenticate with your service or a third party service outside of your control — for instance, if your app uses Twitter or Facebook to authorize users or your require them to sign in to your app first — you can handle that authentication step as part of this flow. First specify the user_auth_url or user_auth_message parameters when using chat.unfurl. The URL should point to a page you control. If relevant to your app, include any state information you need in the URL. Authenticate them into your app using service-specific login and password techniques. Generate a Slack OAuth authorization URL and send the now-authenticated-with-your-service user to authorize your Slack app. Associate any additional accounts like Twitter and Facebook by invoking each authentication flow and returning back to your service. Whether you authorize users before or after Slack redirects the user to your OAuth redirect URI depends on how you want to juggle maintaining state and where you expect any authentication fatigue-based drop off to occur. Links will only unfurl if the message they appear in contains a fully-qualified URL. Yes, the protocol like http or https is required. As you register additional domains, workspaces will need to install your Slack app again for changes to take effect on that workspace. App unfurls are a terrific way to build interactive workflows for your internal integrations. Interactive message action invocations only include an excerpt of the original_message, relevant to the links you provided unfurling behavior for. It's best to only register domains that you own, but if you're providing wrapper functionality for domains owned by others, you must follow all the terms, conditions, and policies declared by the owner. Even if that means you can't provide app unfurl functionality for that domain. link_shared events don't contain the original message; your app just learns about any links that match your registered domains. Everyone in a channel can see your app's unfurls. Using authenticated unfurls only requires authentication to unfurl, but still broadcasts those unfurls to a conversation. Bot users can subscribe to link_shared events but only user and workspace tokens may execute chat.unfurl. Imagine the figure of a fiddlehead fern frond unfurling, its universe within unraveled— revealed. In addition to Slack app unfurling, we generate simpler content previews by default. Learn more about classic unfurling below. If a workspace doesn't have a Slack app handler for a specific domain, unfurling will fall back to classic behavior: Slack crawls the URL, looks for common OpenGraph and Twitter Card metadata, and renders some micro-approximation of the content. 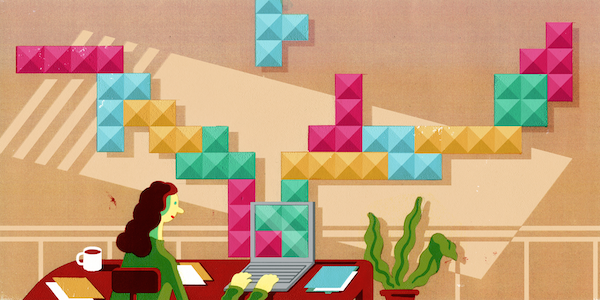 For some domains, Slack even provides its own extra bells and whistles. When deciding whether to unfurl a link we consider the type of content that has been linked to. We treat "media" -- that is images, tweets, videos, or audio -- differently to pages that are primarily text-content. By default we unfurl all links in any messages posted by users. For messages posted via incoming webhooks, the chat.postMessage API method or chat.postEphemeral, we will unfurl links to media, but not other links. If you'd like to override these defaults on a per-message basis you can pass unfurl_links or unfurl_media while posting that message. unfurl_links applies to text based content, unfurl_media applies to media based content. These flags are mutually exclusive, the unfurl_links flag has no effect on media content. There is one notable exception to these rules: we never unfurl links where the label is a complete substring of your URL minus the protocol. This is so a paragraph of text can contain domain names or abbreviated URLs that are treated as a simple reference, and not a link to be unfurled. For example, if a message contains a link to http://example.com with the label example.com then that link will not be unfurled. There are more examples of this rule below. Want to know more about unfurling? Find out everything you ever wanted to know about unfurling but were afraid to ask. Our servers must fetch every URL in a message to determine what kind of content it references. Set both unfurl_links and unfurl_media to false when posting messages to stop Slack from crawling a link and attempting to display an unfurl. Featuring artwork by Peter Ryan.